“Kuidaore” - to ruin oneself by the extravagance of food. This is a term often used to describe Osaka’s food scene, one where mysterious alleys house unexpected culinary wonders, where hearty bowls of ramen demand shameless slurping, and where even the egg sandwiches from convenience stores will blow your mind. Osaka has origins of being a warehouse and trading port due to its convenient geographical location to the ancient capital of Kyoto, and this is how it ended up receiving its nickname of “tenka no daidokoro,” or nation’s kitchen. Wealthy feudal lords had invested in building warehouses to store food and produce, and while its warehouse days may be a thing of the past, a walk through the city today confirms that gastronomy is still at the very heart of the city’s identity. 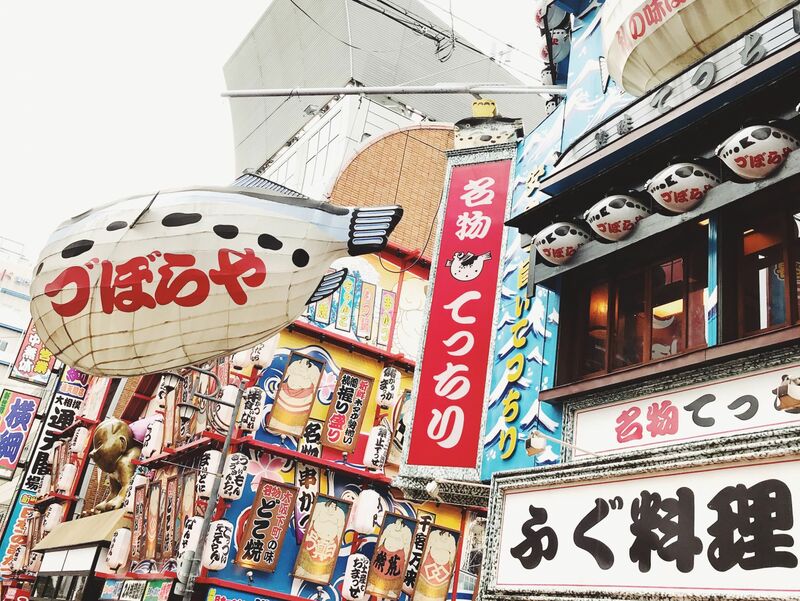 To experience the best of Osaka's culinary scene, mark down these 9 essential destinations. While strolling through Tenjinbashisuji, the longest shopping street in Japan, you may notice a long queue of people standing outside an unassuming restaurant front. No matter what time of the day (between 11:00am and 10:00pm), there will always be a wait at Harukoma, a tiny fewer-than-30-seats sushi restaurant where you’ll surely blend in with the locals while enjoying some of Osaka’s freshest sushi at a reasonable price. Expect platters upon platters of glistening sushi with just the right fish-to-rice ratio. It’s not the kind of spot you go to if you want to pace yourself —orders are taken while you’re in line, and large plates of sushi hit the table as soon as you sit down. Be sure to include grilled eel, yellowtail belly and salmon sushi in your order, and wash it all down with a bowl of red miso soup with clams. It’s no secret that the Japanese have a penchant for brightly packaged snacks with unexpected flavours. While you’ll undoubtedly go home with boxes of said treats, a visit to Osaka’s Sennichimae Doguyasuji Shotengai will present you with a selection of souvenirs that won’t disappear after a bite. This 150-meter-long shopping arcade is lined with specialty shops that sell Japanese cookware, kitchen utensils, restaurant supplies and surprisingly affordable ceramics that look like they’d be worth a fortune. It’s not unusual for these stores to be filled to the brim with fragile wares, so keep your core tight as you tiptoe through narrow aisles and get lost in a world of glaze and glory. Sennichimae is a good place to stroll through if the nearby Kuromon Ichiba market is crowded, and is a must-visit for chefs, restaurateurs and home chefs. No amount of research or guidebook will point you in the direction of Redang (though you’ll have us to thank, now). While you can certainly try on your own, the chances that you’ll find this underrated, truly hidden gem on your own is very slim. Tucked away in a quiet street where tourists wouldn’t necessarily venture to, you’ll find a contemporary kaiseki (multi-course) restaurant where the fare is seasonal and stunningly plated on quirky ceramic wares. Chef Yuki Okamoto’s infectious smile consistently lights up the 20-seater room, and while he claims he doesn’t speak English, we’ll tell you that he’s just a little shy. In his previous culinary life, he served as the executive chef to the Consulate of Japan in Taipei, and spent some time in Australia and Saipan before moving to Osaka and opening his own restaurant 10 years ago. He’s a kikizake-shi, a certified sake sommelier, and selects bottles based on both the daily menu and his mood. In terms of menu, all of the work is done for you—there’s only one multi-course menu for the night, and just trust that it’ll be delicious. Note: Redang is cash-only. This lively market spans 580 meters, and is home to some of the freshest seafood and the most extensive variety of street snacks in the city. The over 190-year-old market features approximately 150 vendors that sell anything from fresh and grilled seafood to fruits, vegetables, grilled meats, pickles and sweets. Samples are distributed along the entire stretch of the market, so fear not if you can’t commit to a single vendor. The narrow covered arcade has become a very popular tourist destination, so if you’re sensitive to crowds, it’s in your best interest to go as soon as shop owners are up on their feet in the morning, just before 9:00am. When it comes to Japanese food, what comes to mind immediately are the classics like sushi, ramen and tempura. One traditional Japanese food that’s rarely seen outside of the country but often takes visitors by surprise is oden, a savoury one-pot stew that’s served year-round but best enjoyed in the cold winter months. Takoume is a 170-year-old institution that’s said to be the oldest oden restaurant in all of Japan. The menu consists of more than 30 items, including their famous “tako kanroni” grilled octopus marinated in a special house sauce. The counter-only seating puts you in the best place to smile and point if deciphering Japanese menus isn’t part of your skillset. The person to watch is the chef in the center, who fishes out daikon, tofu, fish cakes, boiled eggs and various meats out of large steaming vats of dashi, serving guests as they quietly call out their orders. If the thought of a golden mountain of sea urchin and brilliant pearls of salmon roe piled on top of tuna sushi rolls gets your senses going, then Gokai Tachi Zushi may just well be the closest you’ll get to heaven while in Osaka. This restaurant is the kind of spot you’d walk right past unless a local pointed you in its direction—it’s no frills, but the seafood is fresh and it’s a great pitstop as you roam around the popular Namba area. The above mentioned pile of uni and ikura can be appropriately identified on the menu as “uni ikura cornucopia,” and your eyes will surely widen when you see the generous amounts of buttery tongues of uni placed in front of you. Don’t forget to ask for a bowl of the restaurant’s signature omega-packed red miso soup with fish. A visit to this cup noodle museum, which attracts a million visitors a year, is an activity that’ll appeal to the inner college student in all of us. Momofuku Ando is the man to thank for bringing convenience and satisfaction to the world back in 1958, when trial and error in a small backyard shed in Ikeda, Osaka, birthed an invention that the world currently consumes over 100 billion servings a year of. While many museums lean heavily into the world of education, this one will have you feeling equally as entertained as you will enlightened. The interactive museum is very visual—an Instant Noodle Tunnel features a floor-to-ceiling display of 800 bowls of ramen that showcase the evolution of instant noodles; a theater shaped like a cup of noodles plays documentaries; workshops allow visitors to learn how to make noodles, from kneading to spreading, steaming, seasoning, drying and frying. The most popular part of the museum, and rightly so, is the My CUPNOODLES Factory, where noodle lovers can walk home with their one-of-a-kind customized cup of noodles for just 300 yen. Museum admission is free of charge. Izakayas are easy to love, with their lively atmospheres, informal settings, alcohol, innumerable rounds of small bites...and more alcohol. This particular one is loved by locals for its reasonable prices and variety of fresh seafood dishes, which change daily based on what’s available at the market. At heart, it’s an unfussy seafood izakaya, but the menu features a dizzying selection of bar snacks, tempura (a house specialty), hot pots, grilled meats, tofu and so much more. Glass buoys hang from the ceiling, seating mimics crates, and wood menu boards blanket the walls, transporting you to a laid back seaside dive perfect for kicking back and unwinding after a long day. Osaka has no shortage of drinking holes, but one that truly stands out is Bar Nayuta, a one stop shop for a great speakeasy-like atmosphere, tasty drinks and a good time. One obstacle you’ll have to overcome is figuring out how to get into the tiny 20-seater joint; located on one of Osaka’s many unnamed streets, the bar sits 5 floors up in an unassuming building and through a three-foot-door. There’s no menu—owner Hiro Nakayama mixes custom cocktails based on your preferences. Nakayama never makes the same drink twice, so you’re truly getting a once-in-a-lifetime experience. Bonus points: the bar is open until late. Like 5:00am late. Tastemakers Ask A Chef: What Food Can't You Live Without? Tastemakers Talking With Takashi Saito, The Man Who Makes "The Best Sushi On The Planet"